Set in an alternate history 1960, the game places the player in the role of a plane crash survivor named Jack, who must explore the underwater city of Rapture, and survive attacks by the mutated beings and mechanical drones that populate it. The game incorporates elements found in role-playing and survival games, and is described by the developers and Levine as a "spiritual successor" to their previous titles in the System Shock series. The game received overwhelmingly positive reviews, which praised its "morality-based" storyline, immersive environment and Ayn Rand-inspired dystopian back-story. Would you kindly buy Bioshock for only $5 on direct2drive right now? 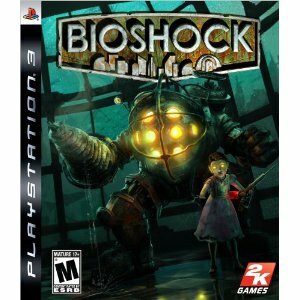 If you've never played Bioshock, and you own a PC, you owe it to yourself to hit up direct2drive right f'n now, Jimmy! 5 bucks gets you copy of one of the best games ever to hit the market. There's a bunch of other games on sale there too, but Bioshock is undoubtedly the cream of the crop.